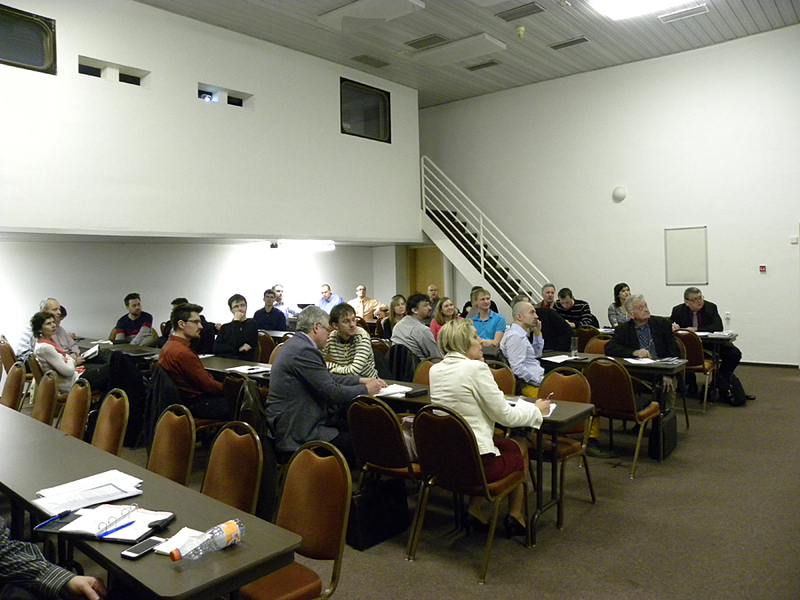 Forty visitors of the international trade Amper 2014 gathered at a specialized seminar organized by Czech Space Office in cooperation with CzechInvest and ICT Alliance. The audience consisted mainly of representatives of ICT companies. CSO informed about opportunities in European space programmes focusing on telecommunications and navigation. Jindřich Krása, the representative of the Czech Space Office gave a presentation on opportunities in the European aerospace programmes for the ICT sector in the Czech Republic. After the initial speech about the CSO activities, the lecturer briefly summarized the existing Czech participation in the international space programmes in areas of telecommunications, navigation, Earth observation, space science and technology from 2005 to the present and listed the sources of their funding. He identified telecommunication and navigation programmes in ESA as a group with the highest potential for involvement in ICT companies. In the next part of his presentation he gave examples of successful projects within individual programmes, briefly enumerated its attributes, rules for participation and financing options. He further analyzed the hierarchy and the characteristics of the individual elements of ARTES programme, with Czech participation. The concrete examples of successful participation of Czech institutions in individual elements were followed by demonstration of potentially interesting project activities for Czech companies. Greater attention was paid to the ARTES 20 programme which is focused on integrated applications. Within this element ho spoke about specific activities targeting the extensive use of ICT services. Another topic was the European Commission's Horizon 2020 and its parts focusing on ICT and space.The visitors were acquainted with potentially interesting activity spilling over into ICT within the Space H2020. The activity envisages the use of breakthrough technologies and linking stakeholders in the process of improving key parameters such as the miniaturization, reduction of electricity consumption or functionality. It is assumed to accept project proposals in the areas of production and energy conservation, improved systems of production processes, high-power electronics with high reliability. At the end of the presentation there were outlined the possibilities of help to Czech entities in the field of ICT that can be provided by CSO. The support include presentation of the partners at the international events, research and analysis of suitable project opportunities or the assistance in administrative paperwork in relation to the ESA. Questions from the audience were mainly focused on the specific application services under the ARTES 20 element, such as e-Health or Smart Cities projects. 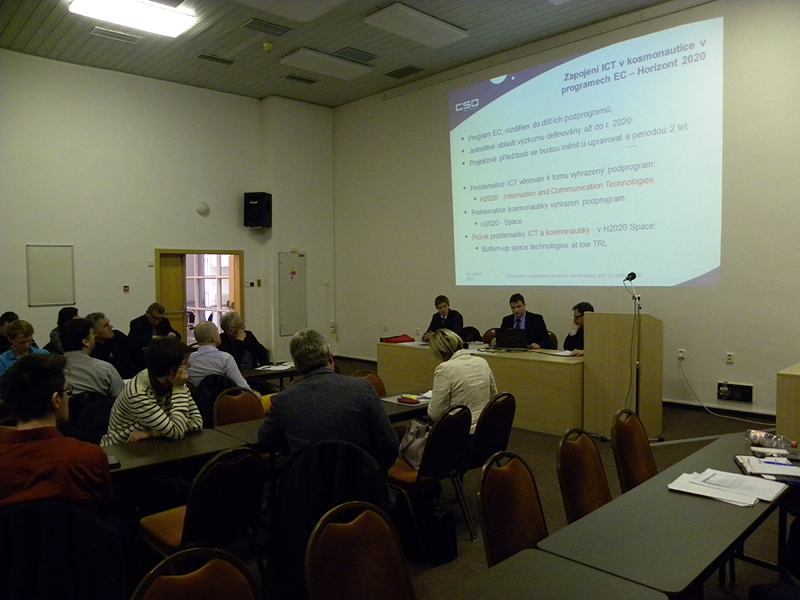 Due to the audience's response to presented issues, the Czech Space Office considers the participation in similar workshops in the future in order to broader the involvement of Czech companies in the European space programmes. You can find the link to the presentation of CSO as well as further information on ESA ARTES programme in the left bar. Zástupce ICT Alliance představil portfolio činností sahající od zprostředkování účasti na zahraničních akcích přes IT školení, partnerství v regionálních inkubátorech až po specifické aktivity určené začínajícím IT firmám a aktuálním příležitostem. In addition to opportunities in the aerospace the seminar visitors could learn which kinds of support offeres the company CzechInvest or how ICT Alliance helps to the growth of Czech companies. ICT Alliance representative presented a portfolio of activities ranging from mediation of participation in international events through IT training, partnership in the regional incubators to specific activities for beginning IT companies and current opportunities. Jindřich Krása from CSO presented specific opportunities in space to ICT companies. The visitors of the ICT forum at the AMPER 2014.